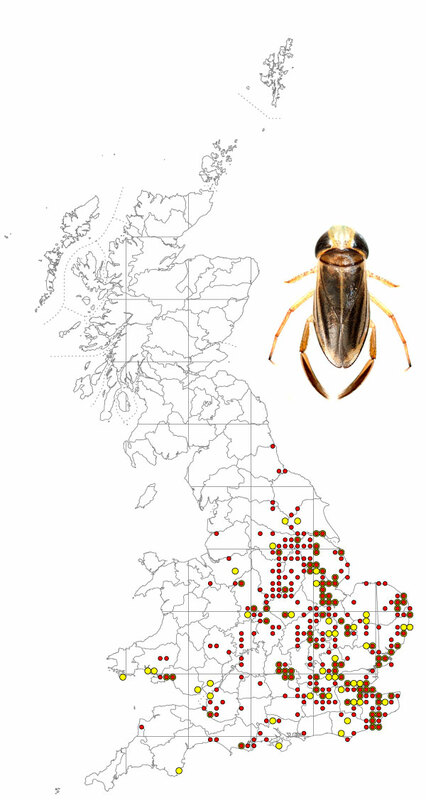 Cymatia coleoptera is small water boatman which is fairly common in the midlands and south east of England, rare in Wales and the west and absent from Scotland. It has a preference for ditches, ponds and lakes with thick masses of plants such as Chara, water milfoil or hornwort growing in clear water, usually with some movement and a depth of 30cm or more. The common form is one with reduced hind wigs (micropterous), fully winged specimens being rare. Like other Cymatia species, C. coleoptrata differs from other corixid genera in being predatory, taking a range of small invertebrates such as chironomid larvae, mayfly, corixid nymphs and water fleas. The bugs mate in June and attach long-stalked eggs to vegetation. The first instar larvae are as large as those of Corixa punctata, a bug which when adult is four or five times longer than C. coleoptrata. Adults develop by late July and give rise to a second generation, the adults of which over-winter. The map is based on records from NBN Gateway, with yellow dots showing pre 1990 records, reds dots 1990 – 2015 records and red on yellow dots overlapping records. 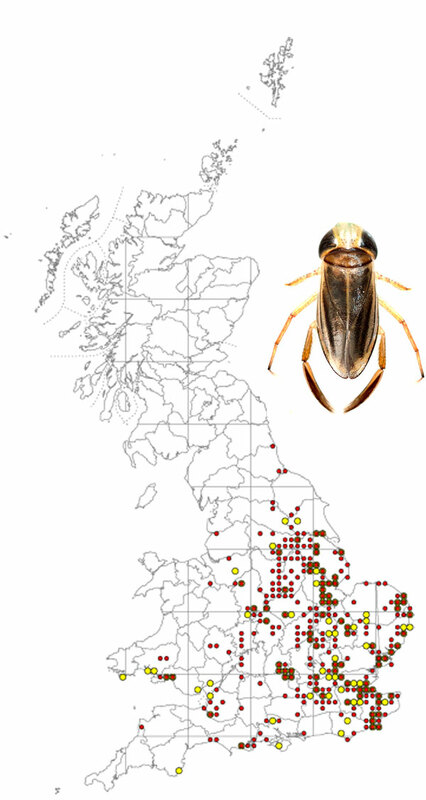 C. coleoptrata has not been recorded in Ireland. C. coleoptrata is a small species, 3 – 4 mm in length, with a plain brown pronotum and brown wing cases which are longitudinally striped but without the finer light and dark patterns of other corixids.